Diabetes affects your blood sugar level by decreasing the production of insulin by pancreatic beta cells. But, apart from impacting your glucose metabolism does it impact other tissues and systems within your body? Yes, of course, it does. Your immune system is compromised that might lead to infections, you are at higher risk of cardiovascular diseases, you might develop peripheral neuropathy, your retinal blood vessels might get damaged, and the list goes on. Apparently, diabetes is your greatest nemesis, and you must fight hard to keep it in check since, as of today, there is no cure for diabetes. People with uncontrolled diabetes are at higher risk of developing diabetic retinopathy. Increased blood sugar might damage or block the retinal blood vessels leading to swelling and leaking from these vessels. In bizarre cases, there might be new blood vessels around the retina that might distort the vision. Ultimately, if untreated, you might lose your vision one day. You might be wondering if diabetic retinopathy is a common thing? Well, in fact, diabetes is considered as one of the leading causes of vision impairment among middle age population. If you are diabetic and recently having a problem with your vision, do not waste time. Book for an appointment with an ophthalmologist today and get your eyes checked. Your doctor will put a few drops of mydriatic agents on your eyes that will dilate your pupil, and then he will examine your eyes with a special lens. In addition, your doctor might use fluorescein angiography to see if there is a blockage within your retinal vessels. When the dye passes through your retinal vessels, a special camera will take pictures of your retina and will show if there is a blockage or if your retina is leaking fluids. Alternatively, optical coherence tomography (OCT) might be used to inspect your retina. This machine will scan your whole eye and measure the total thickness of your retina. By doing so, your doctor might be able to tell if there is a swelling within your macula. The simplest way of preventing or treating diabetic retinopathy is to control your blood sugar. Consult your nutritionist, exercise regularly and keep your blood sugar in check. It might prevent diabetic retinopathy, and in some cases improved blood glucose level might improve the visions of already affected persons. In addition, your doctor might advise steroid injections or “anti-VEGF” shots to your eye to reduce the macular swelling and improve vision. Alternatively, if medical management fails, you can go for surgical treatment that includes laser surgery and vitrectomy. Here, the surgeon will seal off the leaking vessels or remove the newly grown blood vessels around your retina. In addition, your whole vitreous gel and hemorrhagic fluids might be removed through vitrectomy surgery. This will allow light to fall on retina properly and thus improve the vision markedly. Despite all those effective treatment programs, the best thing to do is to keep your blood glucose in check. Then you will not have to bother about diabetic retinopathy and its dire consequences. 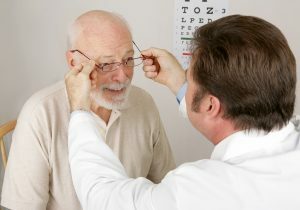 But if you still have further questions or if you want to have a second opinion from an expert then head to www.eyecareassociatestx.com. Their experts will answer to all your concerns.